Victoria Morrisroe, Senior Communications Manager at the ESRC and manager of the ‘The World in 2065’ ESRC writing competition, in partnership with SAGE. 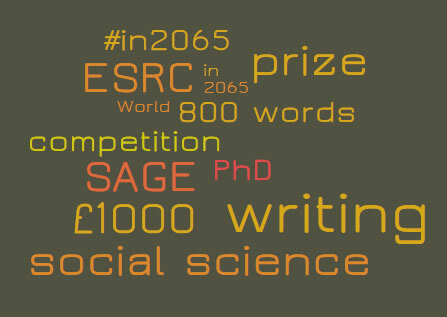 I’m thrilled to be managing the ESRC-SAGE World in 2065 Writing Competition. Working on this competition has allowed me to let loose my creative side; from shaping the design of the competition, to working with designers on the eye-catching poster, and finally writing this post. Benjamin Franklin said “Either write something worth reading or do something worth writing.” And this is what I am hoping to encourage our ESRC-funded PhD students to do through this competition. As the entrants will either be studying for their PhD or have completed it recently I expect they will be practised in writing in an academic style. However, writing creatively requires some very different skills, so it will be interesting to see how they cope with changing from a formal style to a freer style of writing. To help judge this competition I’ve enlisted a talented team, including; ESRC Chair Dr Alan Gillespie; freelance journalist and higher education specialist Martin Ince; Executive Director of SAGE’s Humanities and Social Science journals programme Miranda Nunhofer; and Production Editor for the Guardian’s science desk Tash Reith-Banks. Between them they have a wealth of experience of the social sciences, as well as having written for wide and varied audiences. We’ve already received a glut of entries for the competition and I’m looking forward to a flurry of entries at 15.55 on 15 July (I remember what it’s like being a student with a deadline!). And I’m looking forward to reading your thoughts on what the social sciences will look like in the future and what you think social science will achieve over the next 50 years. Keep reading the ESRC blog for more details on the shortlisted entries and the winners. We will be publishing a selection of the best and most interesting entries here in the future. Are you an ESRC-funded PhD student or have been within the last three years? If so, I want you to tell me how your research or discipline will shape the world in 2065, in up to 800 words. The winner will receive a £1,000 cash prize and the two runners-up will receive £500 each. All shortlisted entrants, including the winner and runners-up, will receive a master class delivered by SAGE on ‘How to get published’, and their articles will be published in print and online. So please submit your entry by 16.00 on 15 July 2015. You can find out more about the competition and the terms and conditions on our website.